Pittsburgh Steelers NFL Bed in a Bag (Full) Make a proud statement in your room for your favorite NFL team with our 7 piece Bed in a Bag Set. Whether game night or just another night for sleeping; the bold and large applique logo stands out against the solid color background and team color accented stripes; making quite the impression. This polyester/cotton blend set comes with 2 sham; 2 pillowcase; 1 flat sheet; 1 fitted sheet and 1 applique comforter. Pittsburgh Steelers Commissioner Office Chair Please Note: Due to the size of this furniture, it is not eligible for Expedited shipping. We have the best seats in the house with our new, Officially Licensed Leather Office Chairs! If you are a sports fan this is a must have. It has all the ergonomic features you would expect from a high end chair. We have designed the chair like a high end sports car. Comfort is the name of the game. So relax and get your work done. You won't want to get up! Officially Licensed using Top Grain Leather in the Team or school Colors Contoured Lumbar Support extra padded seat for maximum comfort Tilt Tension Adjustment & Single Lever Seat Height Control with Locking Mechanism. Styled and manufactured to replicate a sports car bucket seat. Be the envy in the Office or the Block. A must have for any sports fan, student or alumni. Pittsburgh Steelers NFL Licensed 102 Bean Bag Chair Size: Circumference: 102 Diameter: 32.5 This Bean Bag Chair is the perfect addition to any sports fan's bedroom. The shell is made of 100% Cotton Duck with Virgin Polystyrene bead fill for a soft, comfortable feel. The panels are dyed to match your the NFL Pittsburgh Steelers primary colors with the logo featured prominently in the center. Adventure Furniture N0518PIT Pittsburgh Steelers Coffee Table The logo coffee table features your favorite NFL team logo (carved and painted) displayed under an oval glass top. The 46 w x 30 l x 19.5 h table is a perfect size for entertaining in any game room family room or den. The legs and frame supporting the logo top of this furniture are constructed from solid birch wood. 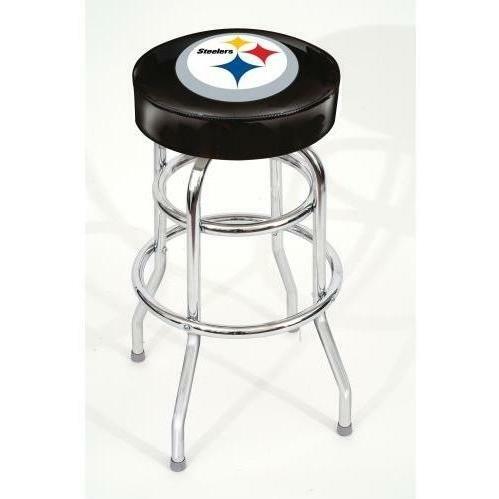 Imperial International Pittsburgh Steelers Bar Stools Imperial International bar stools featuring your favorite sports teams. This San Francisco 49ers bar stool is made from chrome plated tubular steel. Each stool is coordinated to the individual team colors and silk screened with the team logo. Cushion is 5-1/2 in. Thick and is a 14-1/2 in. Diameter. Each bar stool features commercial grade vinyl seats. Sports team barstools stand 30 inches high. Each Imperial bar stool takes 2-3 weeks to ship. Pittsburgh Steelers Team Logo 8 Foot Pool Table Steelers fans, proudly display your team spirit with the Pittsburgh Steelers Pool Table from Imperial. This stunning billiards table features the officially licensed Pittsburgh Steelers logo masterfully reproduced above the Lexan photo quality, scratch-resistant surface. Imperial provides a premium slate bed, select table features and easy-to-clean polyester fabric with anti-friction coating for enhanced accuracy, durability and ball speed control. Bring home the only pool table that combines the exceptional quality of Imperial with the pride of Pittsburgh. Pittsburgh Steelers 8 Foot Pool Table Cover Protect your pool/billiard table in style with this brand new and durable Naughyde Pool Table Cover screen-printed with your favorite team's logo at the center. This deluxe pool table cover fits most standard 8 ft. tables and measures 56 in. wide by 100 in. long. Pittsburgh Steelers NFL Broadband Quad Tailgate Chair Pittsburgh Steelers NFL Broadband Quad Tailgate Chair Enjoy your pre-game tailgate party in the ColemanÂ® NFLÂ® Broadband quad chair. It's designed with your team's graphics and colors; and it features a mesh cup holder. The flexible steel frame makes for easy set up and take down. Each NFL Broadband Quad Chair is made with a powder-coated; reinforced steel frame and features the team graphics on front and back; a mesh cup holder built into arm rest; and includes carrying case with team's logo. Dimensions: W 22 x D 23" x H 36". 225-lb weight rating. Officially licensed. Made in China. Pittsburgh Steelers Inflatable Chair Were sure you can find many uses for this team color inflatable chair, it's perfect for your rec room, bar, bedroom, or tailgating. Each Inflatable Chair is oversized measuring 42"x42"x28" and is made of 100% PVC. Comes with Foot Pump. Wild Sales SC02124 Pittsburgh Steelers Task Chair Officially Licensed Contemporary Task Chair. Whether you are working on your computer at home office or in your dorm you can express yourself with your favorite team furniture. This Contemporary Chair is an ergonomic modern styled Licensed Task or Computer Chair made for maximum comfort and support. The fabric is a two tone colored micromesh polyester padded material for cool comfort. Eurostyled and trimmed in brushed aluminum. The team and school logos are embroidered on the back of this chair. Baseline Pittsburgh Steelers Video Chair Get your game on with this Pittsburgh Steelers Video Chair. Designed for relaxing in front of the TV and keeping you comfortable while you maul the final boss or score a touchdown in the final seconds of the game, this game chair not only supports you, it shows your support of the Pittsburgh Steelers. The team's colors and logo look great on the microfiber and mesh fabric. When not in use, the chair folds in half so you can transport and store this furniture easily. Pittsburgh Steelers Plastic Table Cover Pittsburgh Steelers Plastic Table Cover These heavy duty plastic table covers are perfect for game day parties or tailgating. They are officially licensed and feature your team's logos. The table cover is 54"x108" and fits a standard 8ft. banquet table or 2 card tables if cut in half. Protect your good furniture. Product enhancements by the product manufacturer may result in the item(s) being slightly different than they appear in the images posted. 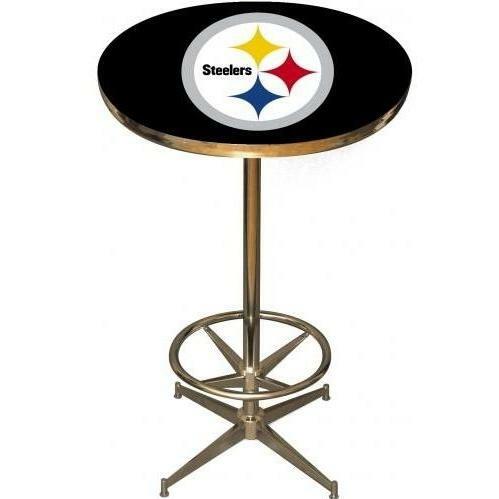 Pittsburgh Steelers NFL Tailgate Table with Net The Ultimate Table for Tailgating and Table Tennis. Great for outdoors- barbecues- sports and family functions. This 2'x8' table provides an extra two feet to a standard style table. The surface represents a football field. You simply fold up (to a 2'x2' size)- grab the handle- and go. Light weight- sturdy aluminum design. The NFL Licensed table converts to a portable table tennis table with a net that secures to the sides for when the food is cleared. Pittsburgh Steelers 9 ft Patio Umbrella Score Big with our Licensed Market Umbrella featuring your favorite team. Our large Umbrella spans a whopping 9 feet and is adorned with official team logos and matching team colors. Made with durable canvas and strong wooden pole that will fit most patio tables and shade your furniture. These Umbrellas are sure to help you beat the heat.